The prophesied day of doom may not yet have come for Infowars founder Alex Jones, who proclaimed YouTube would summarily ban him on Sunday but rode out the day with the account intact. But kindred soul Mike Adams, the self-declared “Health Ranger” behind questionably reliable pseudoscience site Natural News, recently got slapped with his own YouTube account termination. Adams is kind of like an alternative medicine-themed Jones who markets his own supplements store with everything from unfounded anti-vaccine theories to distrust of virtually all science-based medicine, as well as vehemently nationalist and pro-gun content. He has gotten in trouble before when Google temporarily delisted Natural News in 2017—but despite speculation it related to the reams of inaccurate medical information that the site injects into search results or Adam’s belief the CIA was somehow involved, it turned out Google merely penalized him for sneaky redirects. It is hard to say just how big or influential Natural News is, but its unsupported articles on topics like how lemons prevent cancer and spirulina pills boost brain function regularly went viral on Facebook as recently as 2014, per Slate. An archived version of Adams’ YouTube about page (alas, from 2016) showed he had at least 100,000 followers and at least 21 million views. 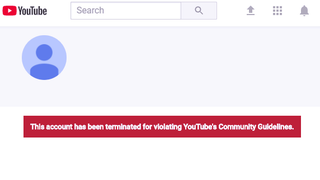 Now, going to that account results in a message saying it has been “terminated for violating YouTube’s Community Guidelines.” It’s not clear what exactly triggered the ban. In a series of angry posts, Adams called the account termination part of a “censorship rampage” directed by the Southern Poverty Law Center, a nonprofit that monitors hate groups, but noted one of the strikes was because of a years-old interview with the author of a book titled Nobody Died at Sandy Hook. His explanation made explicit mention of “mass shooting false flag” operations—hinting that the remaining strikes probably had something to do with that specific genre of conspiracy content, which YouTube has repeatedly failed to control on the site. Account terminations are ostensibly permanent, though there’s an appeals process by which account owners can contest the site’s moderators. YouTube is under a lot of media pressure to crack down on the sheer level of harassment and conspiracy theories that circulate throughout the site, but in the past few weeks it’s been rather inconsistent and reversed a number of relevant bans. So it’s possible that this is not the last we’ll see of the Health Ranger on YouTube, though if the ban sticks, the site’s rules prohibit Adams from opening any new accounts. YouTube did not immediately reply to a request for comment on this story, but we’ll update if we hear back.